I mentioned in an earlier post I have two other “deadline-based” gigs. I should clarify. These gigs aren’t outside jobs, but my own creations. They each started from observations I noted while watching the show My Little Pony: Friendship Is Magic. The first and older of the two projects is The Tao of Maud. 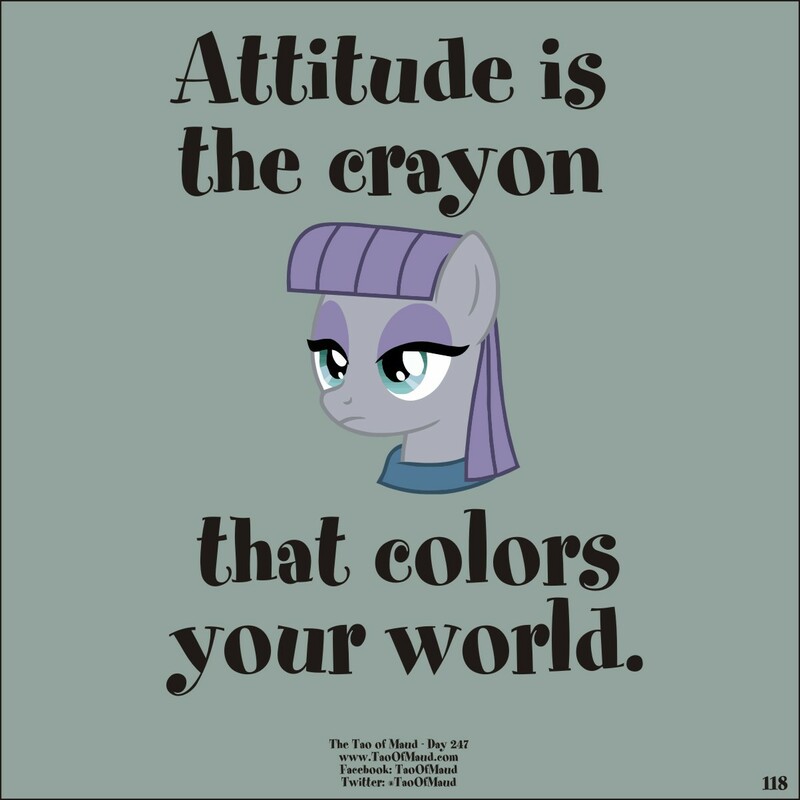 It is a daily post, centered around the concept that the character of Maud Pie is actually Zen-based. It’s more aphorism based, recycling quotes from famous sources modified to fit the world it is based from. We hit day 250 this week. Gummy had until this point just been a silent character – stoic to the point of functional inactivity at times. Now we know why. He’s a Nihilist. You know what they say – still waters run deep. This just proved they are also gator-infested. From this moment, I saw an opportunity to create a commentary style panel, The Te of Gummy. The Tao of Maud is relatively easy to write. Actually, it feels more like I am curating a collection of ideas and determining how best to display them. The Te of Gummy is a pure tightrope walk. 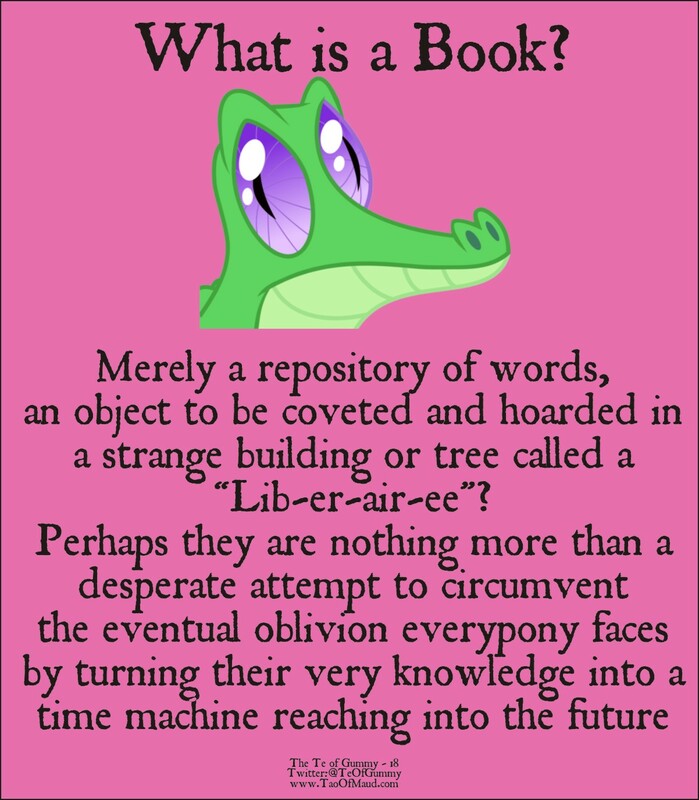 I have to come up with a topic, an observation, a pony-connection, and publish it all within a 24-hour period. It’s a different style of writing than I am used to. The adrenaline rush is amazing, as is the sheer terror when I’m drawing a blank. It is stretching my wings as a writer. You can view the Tao of Maud on Tumblr, Twitter (@TaoOfMaud) and Facebook. as well as its own website. The Te of Gummy has a presence on both Facebook and Twitter (@TeOfGummy). This entry was posted in Writing and tagged Blogs, My Little Pony, Philosophy, writing. Bookmark the permalink.